Colorado Springs Mayor John Suthers is applauded as he enters his watch party in the Gold Room after being re-elected on April 2. Results are cemented in Colorado Springs’ April 2 election after the final 100 ballots or so were counted last week, according to the city clerk’s office. Those last few ballots weren’t close to swinging the election in a new direction, however. Incumbent Mayor John Suthers and incumbent at-large City Councilmen Bill Murray and Tom Strand successfully defended their seats, while former Secretary of State Wayne Williams won the third open at-large council seat. Voters also overwhelmingly rejected Issue 1, denying city firefighters collective bargaining privileges. 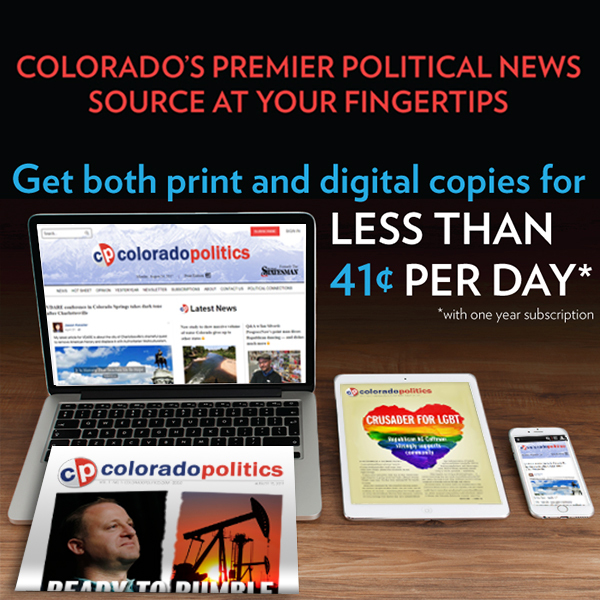 Murray, Strand, Suthers and Williams will take their oaths of office at 10 a.m. Tuesday on the south steps of the Colorado Springs Pioneers Museum, 215 S. Tejon St.
As of April 5, 98,281 ballots of the 267,714 mailed by the city in early March had been returned and counted, City Clerk Sarah Johnson said. As of Friday, that number rose to 98,384 when additional military ballots and others were counted. Those results were certified and ruled official that afternoon, city spokeswoman Jamie Fabos said in a release. Voter turnout hit 37.11 percent. Suthers received 69,771 votes, or 72.51 percent of the total, according to the clerk’s office. Williams received 47,622 votes, 18.61 percent of the total; Murray received 31,610 votes or 12.35 percent; and Strand received 31,107 or 12.15 percent. A total of 65,357 ballots were cast against Issue 1 while 31,587 voted in favor, data show. Tuesday’s swearing-in ceremony will be open to the public and broadcast on the city’s Facebook page, Fabos said.